At Thailand’s Sila Evason Hideway, a Six Senses resort on the northern tip of Koh Samui Island, midway betweenBangkok and Phuket, your very own Seventh Heaven awaits. And more. Take a restorative journey, exploring and respecting Asian traditions with a New Age point of view, which might just transform your view the world. Welcome to a world of harmony. If traveling half way around the world to seek alternative mind, body and spirit remedies seems exotic yet attainable to you, then you’ve come to the right place. The convergence of these three key elements which sustain all humans can often become imbalanced with the everyday business of living. Careers, family obligations, social expectations and the like are sometimes causes of that imbalance. A body can shut down, like anything, without the proper nourishment of each and every one of those three factors. That’s why a resort like Sila Evason has achieved a reputation for making life better for its guests. When you step off of Air Tahiti Nui’s non-stop flight from Los Angeles to Bangkok, there’s about an hour’s drive to the resort’s area outside of the city, near Hu Hin. 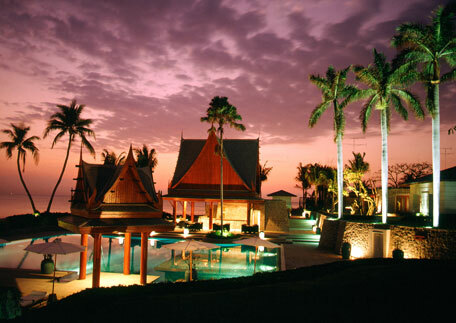 Arriving at the resort, expect to be welcomed by one of the best panoramic ocean views of the Gulf of Thailand. The property’s design was especially created to convene with nature and beyond the outdoor lobby you’ll find the villas hidden into the hills. Walking down the wooden steps towards the spa reception you’re met by the aroma of lemongrass and an ocean breeze no matter what time of year you visit. Every sense is awakened. It’s that simple. And so your invigorating journey begins. High touch, not high tech is the only goal for the resort to create a life-enhancing stay for its guests. From the personal butler who greets you upon arrival to a team of spa treatment experts, you’re immediately in good hands. “We do our best to make guests happy. They have an expectation and we like to raise that expectation even higher,” says butler Emile Chau, a French expatriate who has worked with the resort for several years as a butler. A butler like Chau makes sure the cabana with private lap pool and unobstructed view of the ocean meets to a guest’s taste. 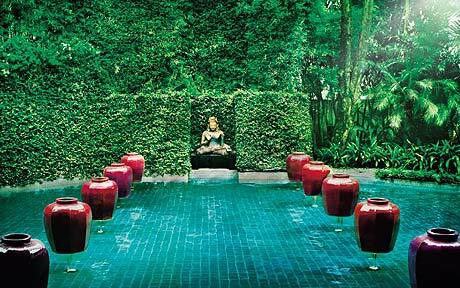 At Sila Evason, the guest is treated like royalty around the clock. The resort boasts 41 Pool Villas and 14 Hideaway Villas that come complete with an outdoor shower with private garden, and a plunge bathtub (rates range from $525 – $1100 a night, depending on the season). All with panoramic views. With attention to personal service is truly flawless. Have special dietary needs that may not concur with the freshest vegetables, meats and sauces on the menu? No problem. The world class indoor-outdoor dining choices provides nutritious spa cuisine that encourages weight maintenance, and even loss, during one’s stay. Both breakfast and lunch are focused on the Evason Balanced Cuisine approach… with an emphasis on taste. Light spa cuisine at lunch is de rigueur. In the evenings be prepared to enjoy Thai food favorites. The restaurant includes three different styles of seating - regular tables, daybed niches, and Thai-style on comfortable cushions set on decking by the pond. Whether you’re there for a romantic getaway for two or simply came to meet new friends, the food and its presentation are impeccable. Even the energizing sunrise and sunset are captured on each side of this highland peninsula. Can you get more in sync with nature then that? “We have a great understanding and passion for physical, emotional and spiritual health which results in our guests feeling invigorated, energized, full of vitality and wellbeing,” shares the resort’s general manager Eric Hallin. When beginning your rejuvenative stay, the important thing to know about the resort is that they work with a team of highly skilled spa therapists and selected holistic practitioners from all over the world. From Europe, the United States and of course, fromAsia. In fact, these experts are some of the best in the world. Their understanding and passion for physical, emotional and spiritual health creates almost instantaneous results for your visit. For top physical workouts, you may not find any better choices than what is offered here. A few of the choices include special sessions that focus on an abdominal work out, a mind/body workout that focuses a combination of Tai Chi, Pilates and yoga, aqua aerobics, all the while focusing on joint movements combining both mind and body. Every discipline unites slow, sustained physical movements with deliberate and relaxed breathing and mental concentration. The spa treatments range from nurturing to athletic. With names of treatments like Secret of Siam, Chocolate Sensation, Sensuous Experience and Hideaway Experience, to mention a few, only the best oils, herbs, flowers, sea elements are utilized to provide unforgettable facials, scrubs and massages, validating this resort as a must-see for celebrities, royalty and international dignitaries. Among my favorite treatments, as an example, is the Detoxify massage that starts with an herbal steam and sauna followed by a cleansing Javanese Lulur yogurt scrub. Then the detoxifying seaweed body wrap is capped off with a lymphatic drainage massage. Sound remarkable? Every treatment is that intense and special and any visitor can’t help but feeling of a renewed sense of being. “We strive to offer something different here. Something you wouldn’t find anywhere else in this combination. We are fortunate to have the caliber of this talent at Sila Evason,” remarks the resprt’s Eric Hallin. Besides the attention given to the physical being, the accent on mental and emotional health at Sila Evason is encapsulated by the alternative healing treatments that some Westerners might not be as inclined to try in their own backyards. What have you go to lose? You’re in a foreign land that embraces centuries of healing practices. Want to go out on a limb? Try hypnotherapy with Neil Beechwood, the Paul Bettany-look-alike Brit who works magic from his career of hypnotherapy training. For those who have never experienced anything like hypnotherapy, it may seem like some hokey “you’re getting very sleepy” type of quest seen in movies. Forget that, because it just might transform the way you approach life afterwards. It’s important to note that you cannot by hypnotized unless you’re is completely willing to surrender to the subconscious. “I think it’s important to look within to heal what’s on the outside,” says Neil Beechwood. One thing that does happen that seems familiar is that Neil counts backward from one to ten before he begins his dialogue with the inner you. Aware and awake, but unable to make any movement while you’re lying down, Beachwood’s calming and healing words make recommendations to embrace a better you. The session, lasting a little over an hour, creates a real sense of an ability to accomplish one’s goals that were worked upon in the treatment. For those inclined to learn an even deeper sense of inner knowledge, the resort also offers palmistry sessions. Yes, good old fashioned palm reading. But don’t look for a red neon palm in the window of the resort, because this is considered serious, centuries-old business here. One of the world’s leading expert in palmistry,Bharat Rochlin, and an author on several books about the subject was on hand to do a session with me. The old adage, “the truth is in your hands” shows how using palmistry to look deep within you can help bring more internal understanding and direction. It can encourage focusing on the real issues in your life by helping to discover who you are, while also giving clarity to your purpose and direction in life. Both alternative and controversial, palmistry is what one makes of it, but it’s difficult to argue with the fact that the life line, heart line and the fate line, which every palm has, symbolizes something that represents the hand’s owner. Rochlin shared an abundance of insight that no one could have known and also predicted some things which have already, in retrospect, begun to transpire. He also shared with me that the human hand is always evolving, hence the palm is always changing to represent the course of one’s life. Want a treatment that’s really Asian inspired? 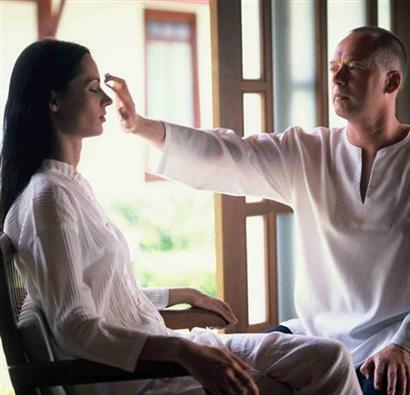 You may also try Cranio Sacral Therapy, a combination of science and healing to offer relief of stress. Winnie Rode is the expert who offered to balance my chakras. Chakras representing the seven focal points of the body from head to toe. Playing a large flute, she “rebalanced” my chakras for over an hour and a half, and admittedly, I felt lighter than air afterward. And it lasted. When visiting a foreign country and especially a resort whose intent it is for healing the mind, body and spirit, it’s always best to go with an open mind. It’s a special land with special people and here at Sila Evason, it is our wish for our visitors to enjoy their stay enough to want to return often,” says the resort’s Eric Hallin.